Hong Kong is a fascinating city in many ways. Living in Shanghai it is often a kind of relief coming to Hong Kong. There everything is working effectively, it is clean, nature is very close, its international, and they make use of technology in good ways. Google Maps is working great on cell phones, especially using HSDPA with speeds around 3.8 mbps. Metro cards can be used in convenient stores to shop with, and on the bus I even saw people using their watches as Metro cards. 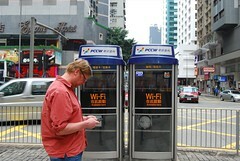 Walking around in the city I ran into two phone booths that offered wireless access. These can be found all over the city and many stores and places offer wireless access as well. They are even doing campaigns right now in taxis where you can plug in your computer and enjoy internet access. Last time I were in Hong Kong there was another campaign offering wireless access in certain taxis. ~ by Andreas Sigurdsson on December 28, 2007.